The summer is still yet to materialise in the Highlands of Scotland, but occasionally we do get a glimpse of how good it can be, and when its good its really good. 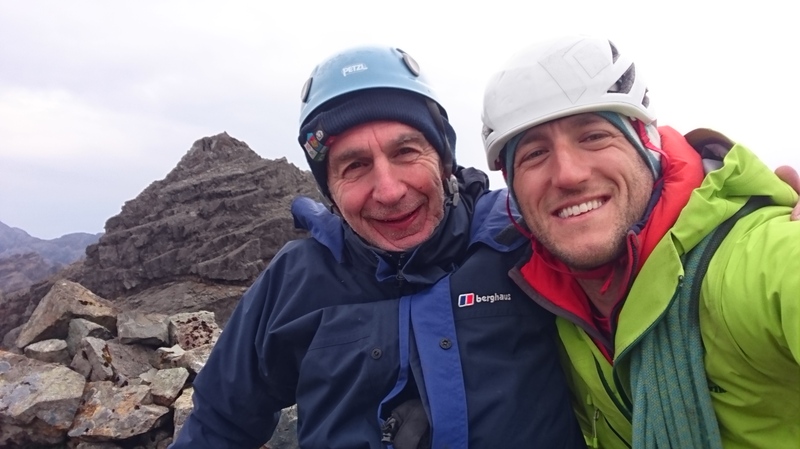 Last week I was out with John and Ben, their aim was to summit the Inaccessible Pinnacle on Skye’s Cuillin Ridge. It was a cool day with allot of mist and a biting North Westerly wind but most importantly: it was dry. Any day I am not in a waterproof on Skye is a real bonus. 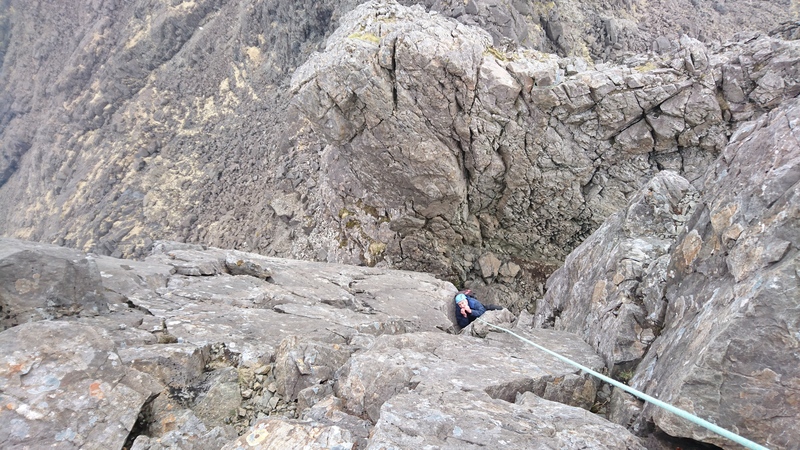 Although not a busy day on the ridge things were quite slow moving in front of us but John and Ben savored the midway belay and we were soon on route to Sgurr na Banachdich. The next day I was out with Jim and his good mate Kev. Again the ‘In Pinn’ was the objective at which, we managed to be first inline this time. 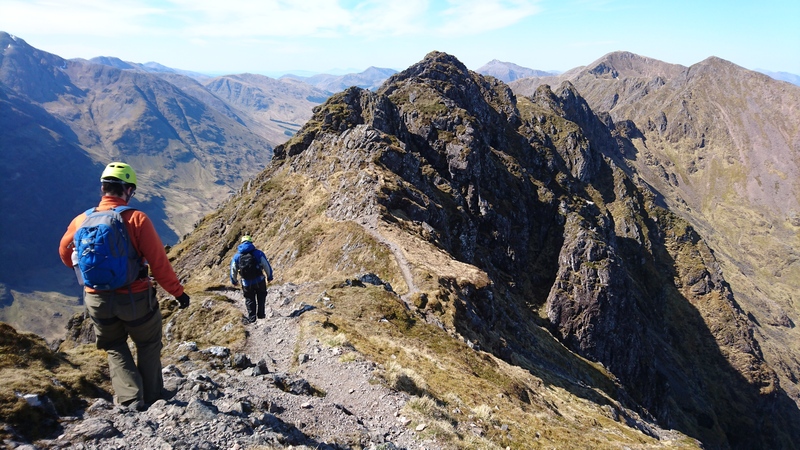 A swift descent and an ascent of Sgurr MhicChoinnich is one of the finest days out on the Cuillin especially when under blue skies and a gentle breeze. 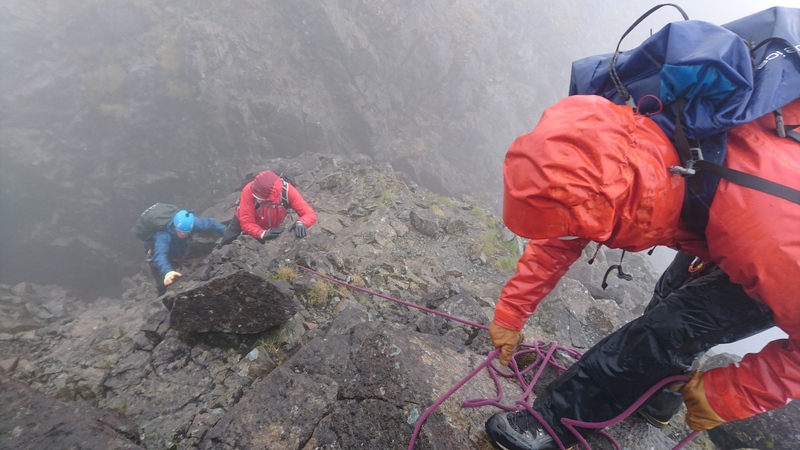 Ofcourse Skye doesn’t allow great weather to last for too long, so unfortunately by the time Jerry and Paul arrived to tackle a full traverse the blip of high pressure had dissipated allowing strong a South Westerly and drizzle to envelope the Cuillin. 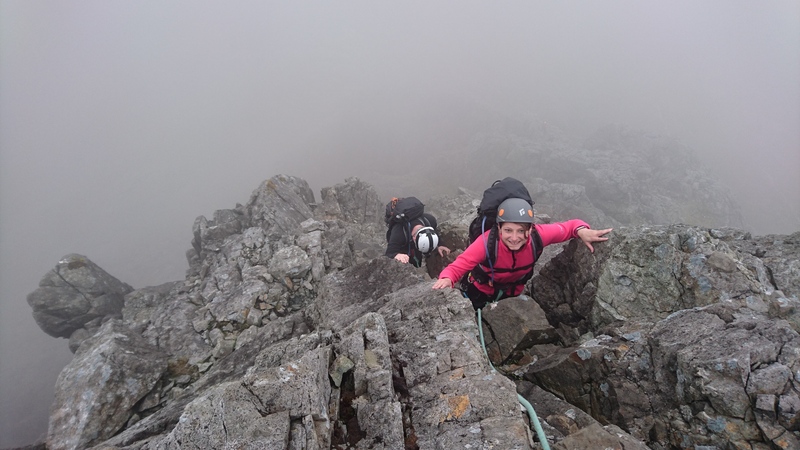 It didn’t spoil our fun though, we made an ascent of Pinnacle Ridge followed by a traverse of Am Basteir and an adventurous rap out of the Kings Cave. I spend most of my spring / summer guiding on the Isle of Skye so yesterday it was nice to be back on home turf for a day out on the Ben Nevis classic: Tower Ridge. I’ve completed lots of climbs and scrambles with Dave and Heather so working with these two is more like a day out with friends now. We enjoyed spectacular views on the walk into the North Face with blue skies and a keen wind to keep us cool. I knew the rain was set to arrive by late morning so we savored the weather knowing it would get a little damp the higher we went. The approach up East gully was, as always; loose and friable, but we made good progress taking in the Douglas Chimney to access the ridge. From here nice scrambling led us upto to the Little Tower where the drizzle started to take hold. 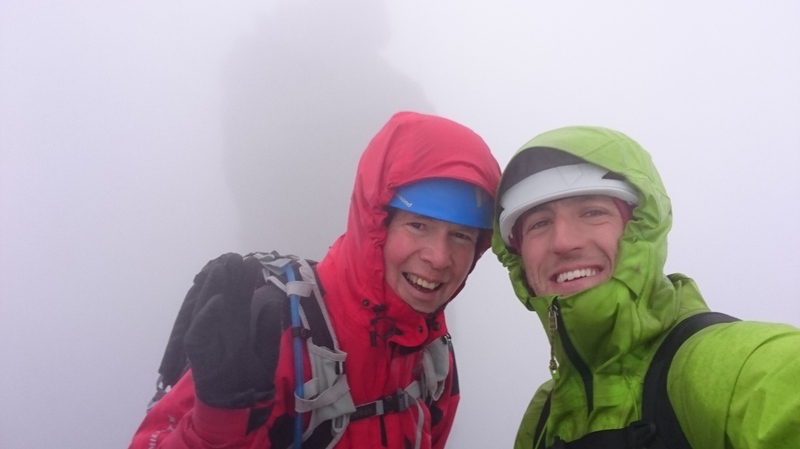 By the time we had traversed over to the gap it was raining hard but it didn’t detract from a great day in even better company on one of the most sought after routes on Ben Nevis. Its been an enjoyable few days working firstly with Joyce who has been steadily ticking off her Munro list. 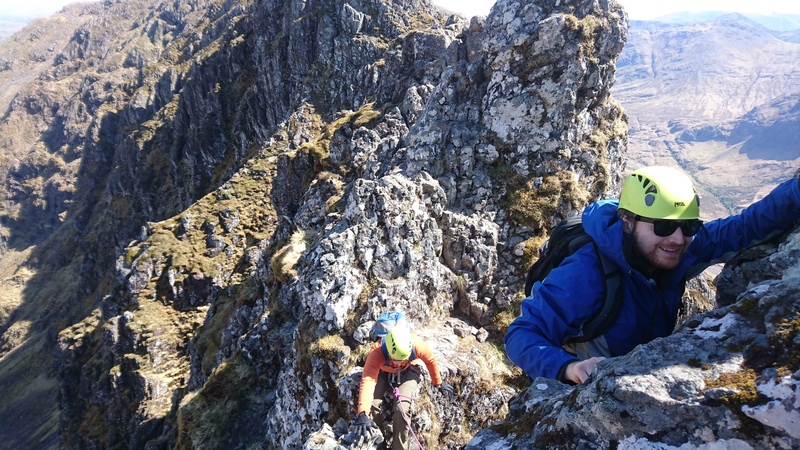 Last Sunday we managed a traverse of the Aonach Eagach, which although started wet and breezy eventually dried up to give excellent views and a rewarding day out. I could tell Joyce was enjoying the atmosphere in amongst the clouds, its nice to see people relishing the challenge despite the conditions. I then shot upto Skye to meet Mick and prepare for a big day out. 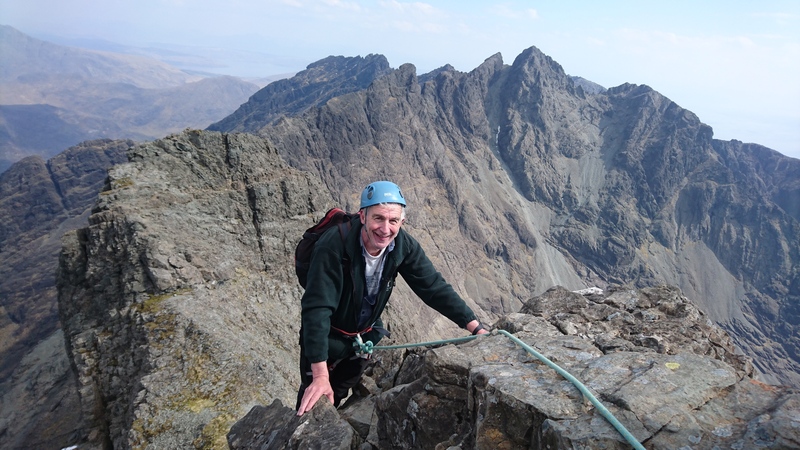 Although Mick has limited climbing experience he has done a reasonable amount of scrambling and so without any further introduction we got stuck into a single day traverse of the Cuillin Ridge. 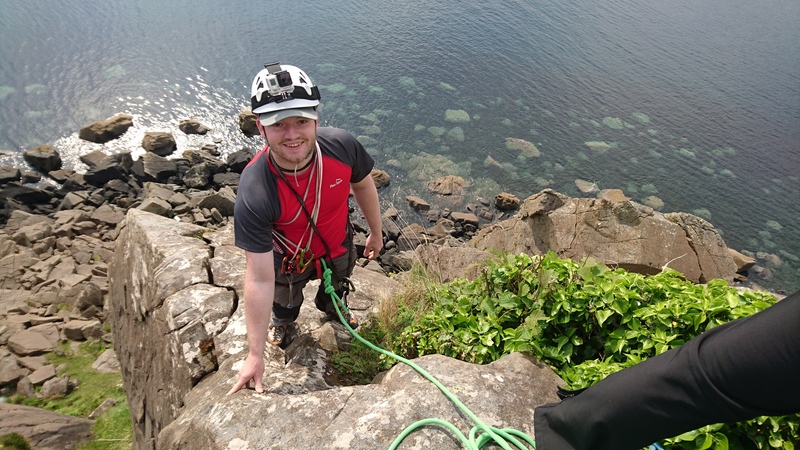 Mick did really well getting to grips with the climbing and scrambling, he endured the traditional battle with the TD Gap and made good progress right upto the In Pinn. From here Micks feet started to hurt a little whilst descending but he kept on moving making good progress over the four tops of Mhadaidh and the ever impressive Bidein Druim nan Ramh. The long approach to Bruach na frithe was hot and humid but by 8pm we were under Naismiths Route which was going to be a sting in the tail. The final mantle nearly outdid Mick but with some grit and determination we completed our traverse before walking out to a beautiful sunset. 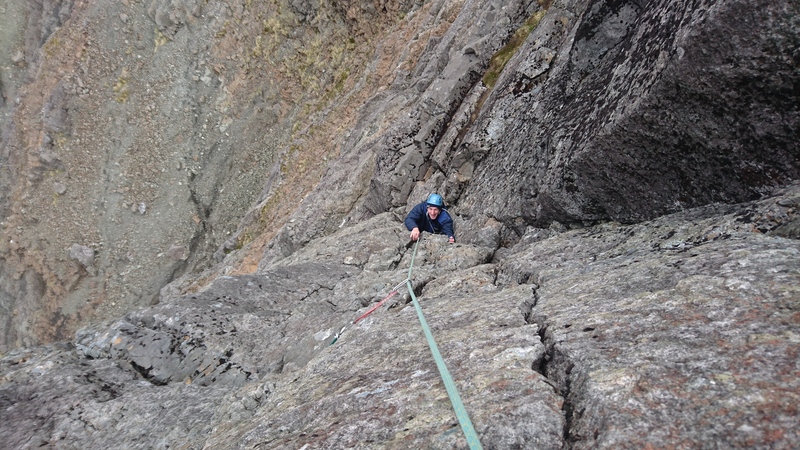 Today Mick and I had a leisurely time climbing rock routes at Suisnish Pillar. the only downside was the horrendous amounts of midgies sheltering down under the sea cliff and eventually following us up all over the crag. We battled on for a further route but it was torturous so we ran away for coffee and cake – well, I had cake! Well done Mick for putting in a great effort. We have just been enduring a more typical run of Scottish weather, with very humid wet conditions making things slow going in the mountains. There have been some breaks in the weather that thankfully coincided with some work and a couple of days off. 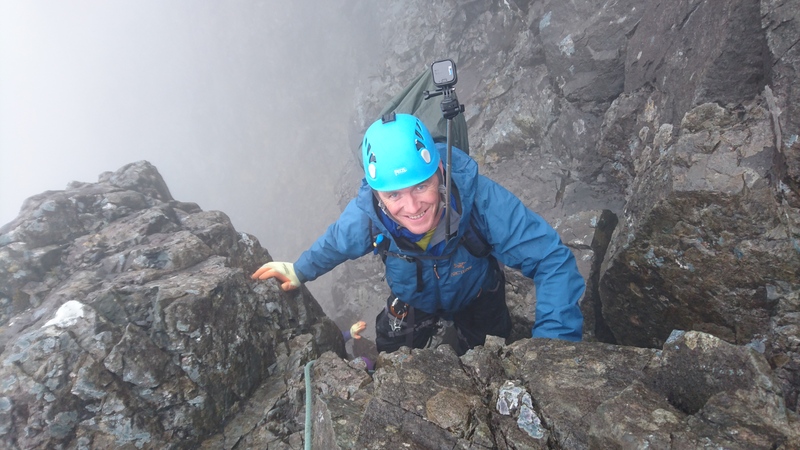 Last week I was back in the Cuillins guiding John up Pinnacle Ridge for West Coast Mountain Guides. The Isle of Skye had allowed John and I a brief lull in the wet weather to enjoy this classic route up the North side of Sgurr nan Gillean. We escaped onto the West Ridge before traversing Am Basteir and rapping out of the Kings Cave. John seemed to enjoy every minute, savoring the experience which was in every way different to 30 years earlier when he had scrambled around these mountains independently as a youngster. On our descent the skies cleared to reveal the northern end in all its glory, a fine end to the day. After a return to wet, misty conditions at the weekend summer briefly returned with a couple of scorching hot days. I enjoyed some family time running around the hills with Jane and the dog, exploring the far eastern end of the Grey Corries and Mamore’s where I hadn’t been to previously. This area provides a contrast to the busy Nevis Range and is highly recommended for the adventurous hill runner. Co-incidentally I met up with my friend Graeme who was then off to run the Tranter Challenge through the night. He nailed 33km before night fell and the mist came with it making it very slow going and less fun than anticipated. Still a great effort though! 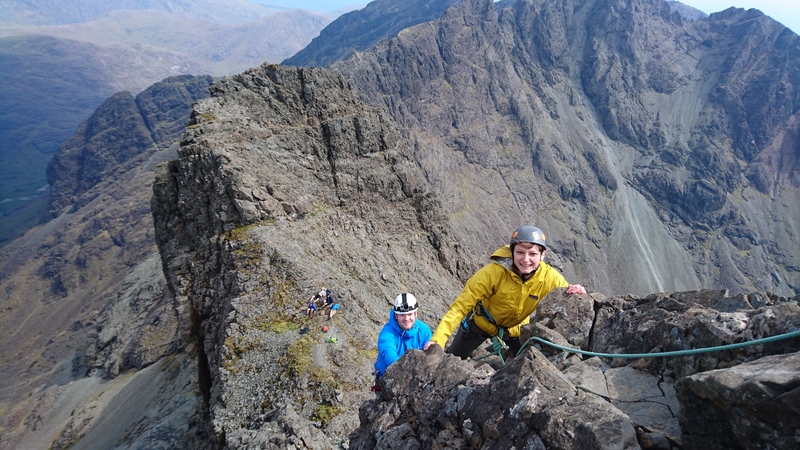 The start of the month marked another stint of Cuillin action, kicking off working for Abacus Mountain Guides with Kate and Tim who were only on their honeymoon! They simply lucked out with a couple of dry, calm days amongst allot of rain, this meant we could go ahead and attempt a traverse carrying all our kit which allowed us plenty of flexibility. Im not sure who had more fun but I loved it. Both should be super proud with their efforts but especially Kate who isn’t used to heights never mind scrambling at the highest level. I then had two days work for West Coast Mountain Guides with John, Mark, Donald and Jacqueline. We were treated to more excellent weather for an ascent of the In Pinn and Sgùrr MhicChoinnich before a steady descent of Bomb Ally which a the name suggests is a little loose…… Day two was a more typical Skye day so without Jacqueline this time the boys went for a more crusiy day on Bruach na Frithe. Well done everyone! Its been a busy period on Skye lately. After Jim and team departed I met up with Gary who was keen to get a Cuillin Traverse under his belt if the weather would allow. 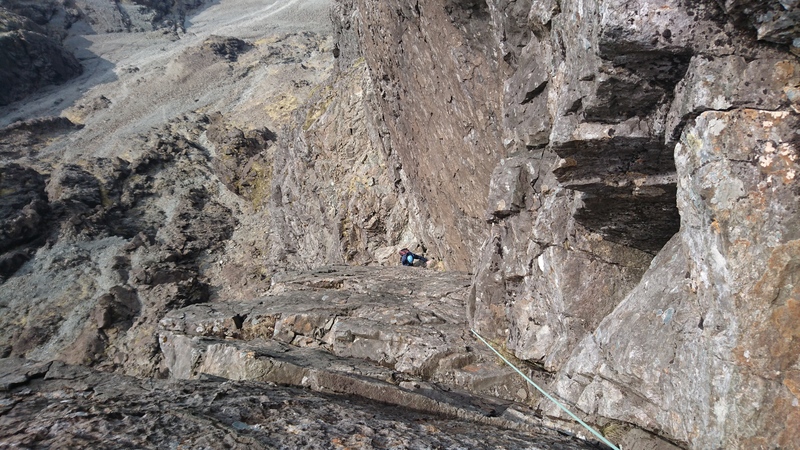 We got warmed up on Pinnacle Ridge which is great route to prepare for a traverse, given the climbing, scrambling, exposure and an exciting abseil followed by a tricky descent down the West Ridge of Sgurr nan Gillean. Gary did well so the next day we decided to stash some kit up on the ridge and prepare for a traverse. Wednesday dawned misty and wet but we set out anyway hoping for a late break in the weather and a dry(is) bivi. Unfortunately the clouds didn’t part and if anything it just got wetter and windier. By the time we got up and off the Inaccessible Pinnacle we were well and truly soacked – time to go down. Gary’s last day was spent climbing Mhadaidh and Ghreadaidh, and finally – we got a view! Well done on your efforts Gary, next time we will book the weather……. The last three days I have been joined by Beth, John and Kev who thankfully brought the sunshine with them. 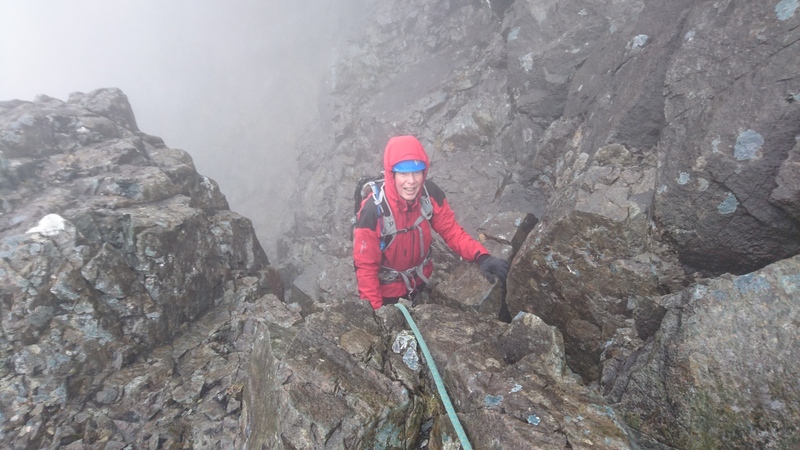 The Inaccessible Pinnacle was first on the hit list so we waited in line on a very busy bank holiday Friday to ensure all the team got to the top of this sought after summit. The day was just too good to go down so we went onto Banachdaich before a de-rigeuer dip in the Alt a Choire Ghreadaidh. Saturday was an active rest day which to me meant a bit of seacliff climbing. 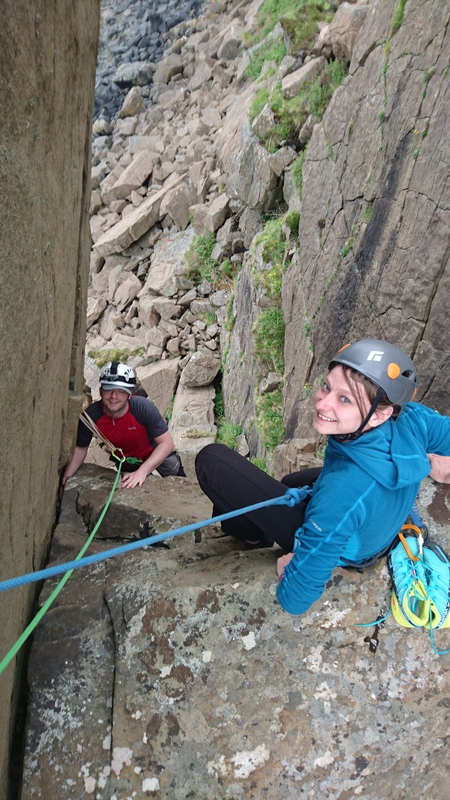 Kev and Beth are both keen indoor climbers and have an interest in progressing to proper rock. 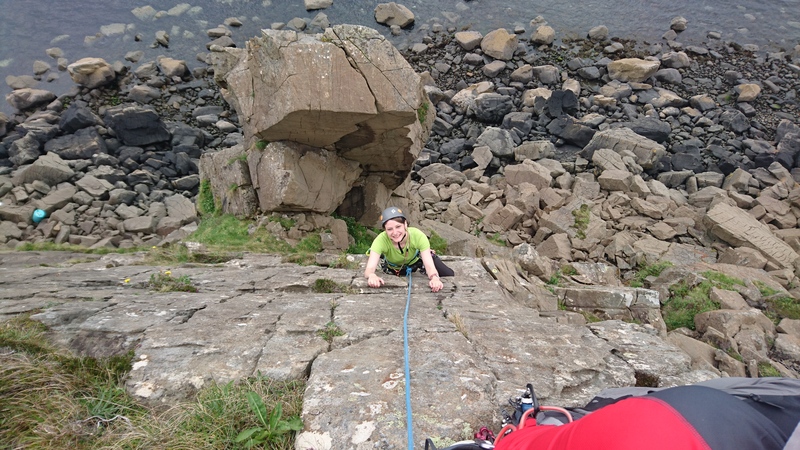 We went to Suisnish Pillar and climbed Right Edge (VD) and Coffee Capers (S) before getting to grips with a bit of a challenge on Eiggbound (HS,4b). 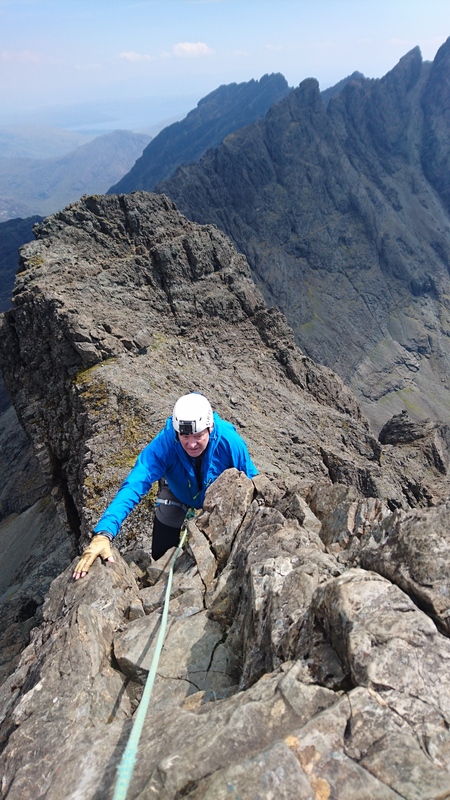 The grand finale yesterday was to be an ascent of Pinnacle Ridge on Sgurr nan Gillean. We had a near perfect ascent in great conditions all be it with just a little mist throughout the day. Another happy team bagging a Skye classic! Thanks for your efforts everyone, its been a great few days. 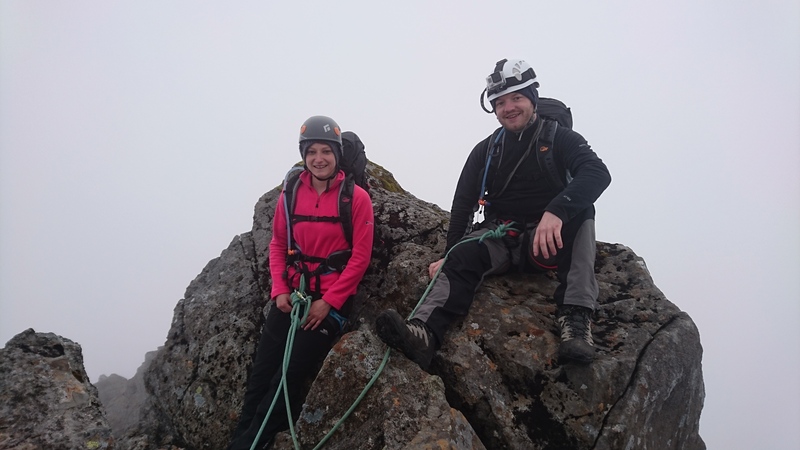 Last weekend Jim, Jenny, Dave and Heather resumed their mission to complete the Skye Munros. 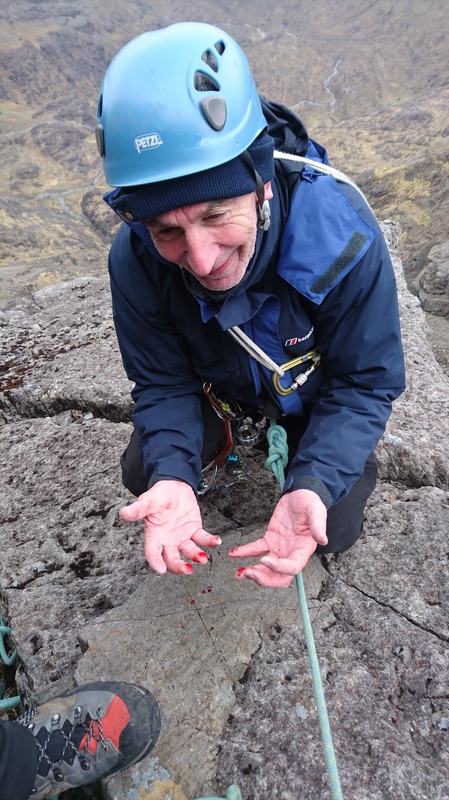 Tom was along as another pair of working hands which worked well whilst travelling over the slippery Cuillin rocks. Saturday we went to the Southern end completed Sgurr nan Eag, Sgurr Dubh Mor and Sgurr Alasdair. Despite the lack of views and rather damp slippery rock we made good progress before heading down the Great Stone shoot into Coire Lagan. 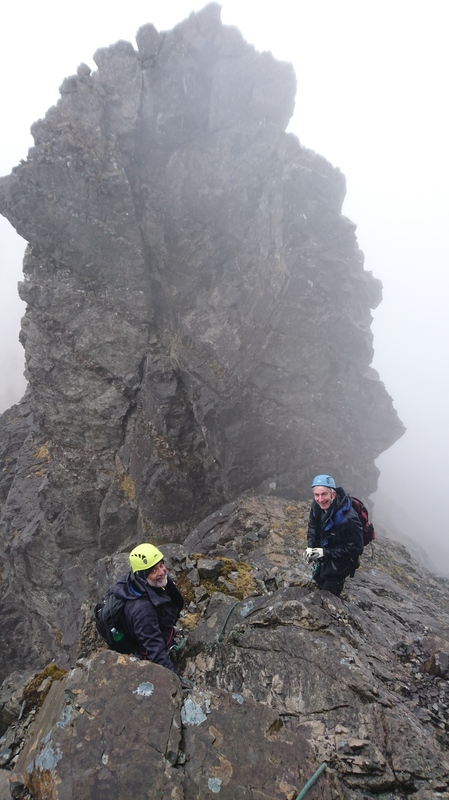 The following day our team made short work of Sgurr a’Mhadaidh and Sgurr a Ghreadaidh. 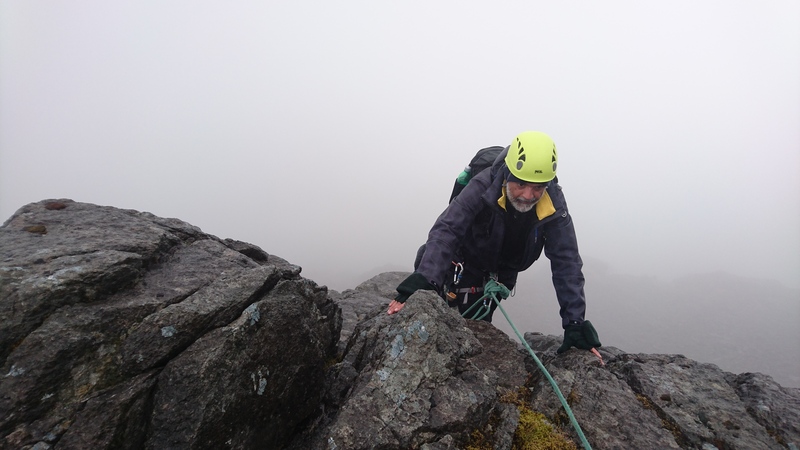 Again the weather wasn’t ideal as strong winds and typical misty wet weather engulfed the central Cuillin making for a tough but enjoyable day. 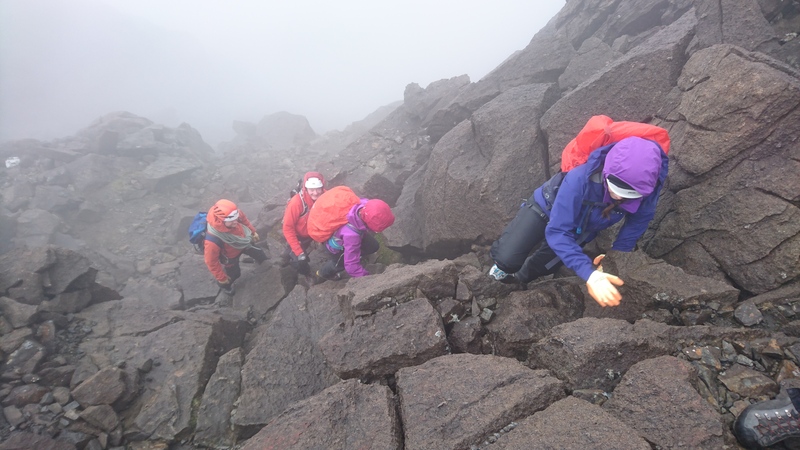 Well done to everyone involved, just one more Cuillin Munro to do! I have been enjoying a little down time, working routes in Glen Nevis and belaying as Kev smashed out a tricky E4 with Euan along to film. 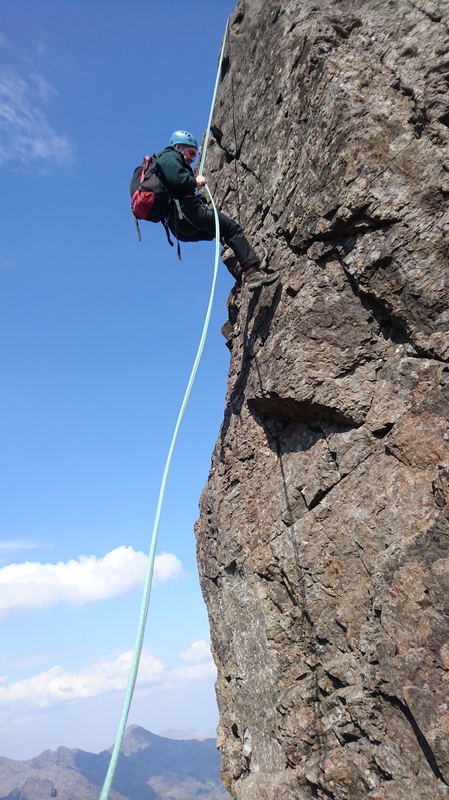 Mid May however, is a busy work period with lots of time on Skye and the occasional Aonach Eagach to rest the legs!……..
Last week I was guiding Katy and Issac over the Aonach Eagach for Lochaber Guides, we had a very sociable day with many other instructors making use of the fine spring weather. 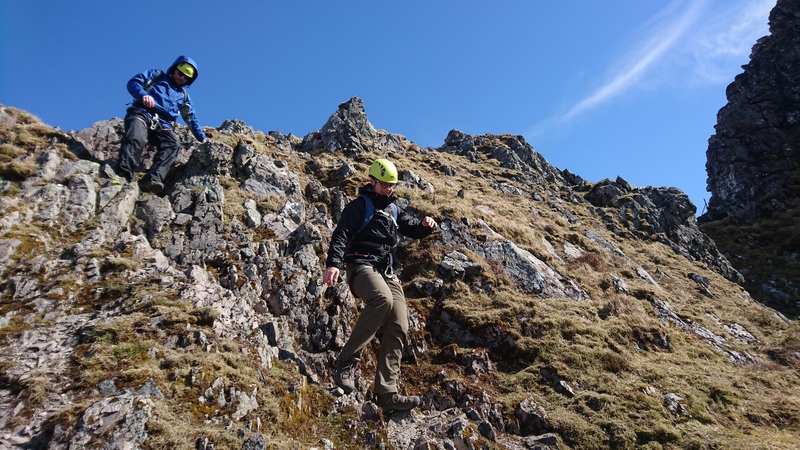 Our team made very steady progress and seemed to enjoy every moment, even though it was their first foray into the Scottish Hills and first time scrambling to boot – well done! More recently I made a return to the Isle of Skye and its mighty Cuillin Ridge. Good job I was feeling energised as both John and Mukesh were eyeing up some tough climbs along the main ridge over their three day trip. 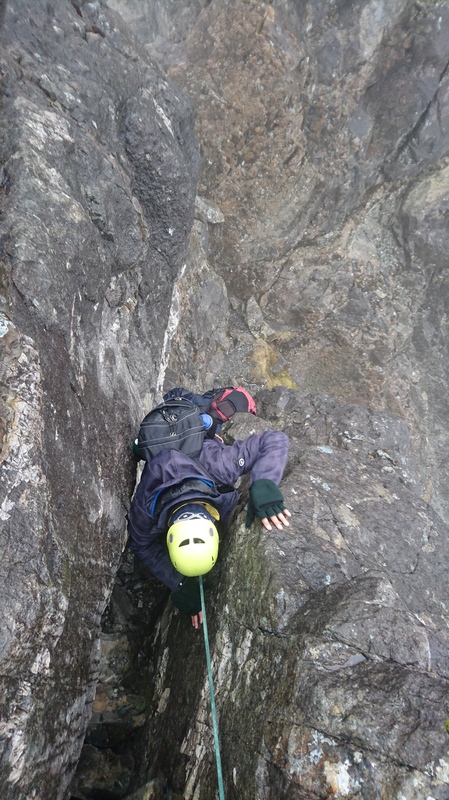 We got warmed up on Pinnacle Ridge which I hadn’t done myself for a few years, for some reason it wasn’t on my clients radar yet this year its the goal of many…..The abseil off the third pinnacle was as exciting as I remember, my guys did great and reveled in the exposure. We descended the West Ridge for the full experience. The following day John had an ambitious plan of TD Gap to The Pinn with all the climbs, this was something I had mentioned last year and clearly the idea had stuck. I was as excited as John, its not to often you get to work on this section, never mind it be dry enough to make it enjoyable. First time this season in the TD Gap and it was as smooth as I recall! Slithering upward progress over we went on to climb Kings Chimney, An Stac and the In Pinn – one of the best days on Skye and highly recommended. Mukesh had unfortunately niggled a knee so had another day resting whilst John and I went for a grand finale on Naismith’s Route to the summit of the Basteir Tooth – not a bad haul for a man of 67 going on 40! As always both John and Mukesh were brilliant company, the perfect way to kick start my Skye season. I was working for Skye Guides.